On Saturday Arena da Baixada reopens after over two years of reconstruction. 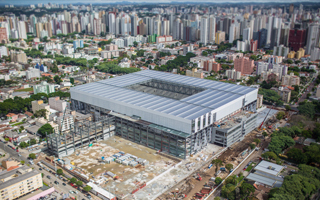 With new roof and one extra stands compared to the previous layout, the stadium will see a turnout of no more than 10,000 people for the Atletico Paranaense vs. J. Malucelli fixture. This limit has been imposed because work is still ongoing on infrastructure and many systems will operate in temporary mode on Saturday. According to a field walkthrough from March 25 there are still seats of facade elements to be installed, while the promenade surrounding stands is hardly ready for crowds on the south side. Similar challenges are dealt with in Cuiaba, where preparations for first ever game at Arena Pantanal are ongoing. The stadium saw first LED illumination test on Wednesday, but the outcome seen below isn't too impressive. Also here seats are still being installed, while skyboxes, catering stands and player facilities are receiving their equipment. These works should be finished by the end of this week, while on Wednesday (April 2) local side Mixto is facing the famous Santos in a cup game.